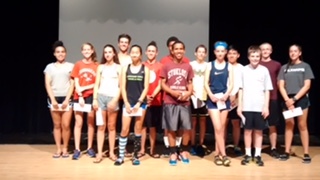 PRC is proud to support a record number of kids through Walter Burgess Scholarships to the American Running Camp. We have awarded 14 Scholarships – 7 full and 7 partial in 2017. These students all came highly recommended by their coaches and are all dedicated enthusiastic runners. Our youngest recipient is 6th grader from West Roxbury, Thomas Savage. Thomas’ father, Brian, is a PRC Member and was a friend of Walter’s. They both are very proud that Thomas was granted this Scholarship and will be able to follow in Walter’s footsteps at the Running Camp this summer. Two other recipients local to West Roxbury/Roslindale are Ema Noonan, a freshman at Boston Latin School and Ben Lawlor, a junior at Roxbury Latin. These families are also well known to the PRC and have volunteered over the years for the Walter Run. Another local recipient is Alejandro Maldonado, a sophomore at Dedham High School. Alejandro is our third Scholarship recipient from Dedham in the past few years, and his coach has only good things to say about the American Camp experience of his athletes. Thank you so much for choosing me to recieve one of the Walter Burgess scholarships to the American Running camp this year! I had a great experience and being at camp made me even more excited for this year’s cross-country season! I learned lots from the coaches and staff there, but one thing that really stuck out to me was rope stretching. I have been adding that to my daily training and I feal that it has already made me more flexible in the few shorts weeks since the end of camp. I was also able to connect with a young runner who will be coming to my school this fall as a seventh grader! Thank you again and I look forward to this years Walter’s Run! Coach Nate Kraft, has sent us two of his students from Lowell High School, Nasir Gibson and Jadiel Pinales. Nasir is a junior, and after having had a great experience at the American Running Camp last year, he decided to try again for a second Walter Scholarship. Because of our successful Walter Run, we had the funds to give Nasir a half Scholarship. Jadiel is a sophomore and is a real runner at heart. He is looking forward to this opportunity to continue his development as a serious athlete. 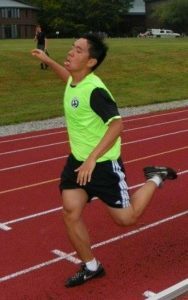 Justin Nguyen giving it his all! Due to the enthusiasm of Coach Ken Pellitier, we often have Scholarship applicants from Gardner High School. This year is no exception, and we are pleased to be able to award a full Scholarship to freshman, Hunter Graves, a ¾ Scholarship to sophomores Justin Nguyen and Cameron Davis. All three of these kids are dedicated athletes, involved in volunteer activities, and strive to improve their ability as runners. PRC aims to help them reach their goals through these Scholarships in Walter’s name. Hi, it is Justin Nguyen from Gardner Massachusetts. I had a great time at the summer (although I am a sprinter in mind), and it was quite hard for me to run. It mainly because I had a summer camp before that focused on academics and taking college classes, so it was hard for me to run on a daily basis. Nevertheless, I still had tons of fun. I made new friends out of state, some from New York, and some right here in Rhode Island. I also learned some new things from the camp such as my passion for running, why I attended the camp and what do I want to strive for in the future. This scholarship allowed me to live on and learn what I want to do in life. Maybe it’s to continue running in college or focus mainly on my academics. Whatever it is, I thank you guys for the opportunity. Athena Mele is a senior at Oakmont Regional High School in Ashburnham, MA. She come highly recommended by her coach and is equally respected in the classroom and on the field. She has the desire and dedication to be successful both athletically and academically. Maddie Sellers is a freshman from Northampton High School. Maddie began running on the track team in elementary school and also on the Sugarloaf Youth League. With her high school team, she has found her niche at the hurdles and is looking forward to the knowledge and experience the American Running Camp will provide her this summer. We have awarded a full Scholarship to freshman Sara Kronengold and a half Scholarship to sophomore Mary Kate Urban, both from Guilford High School, Guilford, CT. Both of these young women are passionate runners, have volunteered at local 5Ks and other races, and are excited to have a chance to participate in the American Running Camp to learn from the best and to continue to improve their abilities. We have one final out of state half Scholarship recipient, Hannah Contino, a 7th grader from Jamestown, RI. Hannah is a real go-getter. She has participated in numerous races (placing in her age group), participated in the Boston Marathon Youth Relay, and ran in the Junior Olympics. She has volunteered in many events and even started her own bumper sticker business, donating a portion of the profits to the local art center. Hannah is going places and The American Running Camp is going to help her get there. Another year of amazing committed young athletes ready to strive for more with the help of the Walter Burgess Scholarship and the American Running Camp. Walter continues to encourage runners in ways he probably never imagined. He would be more than proud!